SQL Excel adds easy database access to MS Excel. This addin helps in simplifying data retrieval from SQL Server, Oracle, Sybase, MySQL, DB2, Firebird and any other ODBC compliant database. The Addin adds a toolbar into Excel. You can then setup the details to connect to your ODBC data source. 1. 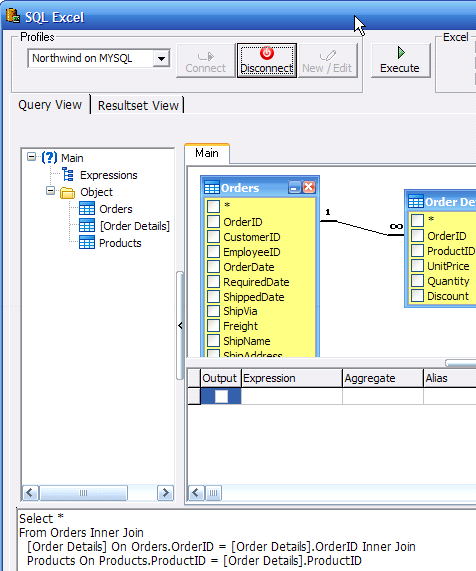 Connect to a datasource using the SQL Excel Addin. Drag the database tables onto the main working area. 3. Run your query by pressing the “Execute button”. 4. All results will be shown in a tab called “Query Result”! 5. And you evn have the option to save the query results to a new workbook or worksheet. Talking about productivity tools, this is definately one of them on my list.